Our windows are designed with energy-efficient features, such as foam insulated sashes and frames, triple pane glass packages, krypton gas fills, and triple Low-E coating. These components help keep your home warmer in the winter and cooler in the summer, reducing the strain on your HVAC system to maintain comfortable interior temperatures and potentially lowering energy costs. Our windows are fabricated from premium-grade vinyl, making them incredibly tough and resistant to warping, cracking, and rotting over time. Since they will maintain their appearance and structural integrity, these windows are also low maintenance, so you won’t need to worry about scraping or repainting them a few years after installation. 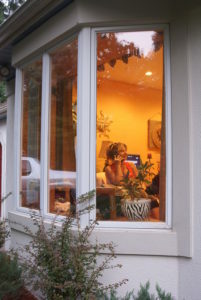 To learn more about the many benefits that a bay window from ABC Seamless Home Specialists provides, contact us today. We would be happy to schedule a consultation at your home in the Oregon, WI, area.